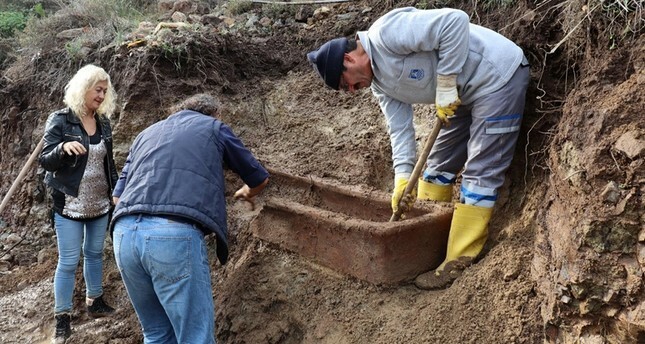 An ancient tomb dating back to late Roman period was found Friday in the Aegean resort town of Bodrum in southwestern Turkey's Muğla province following the heavy rains that left the town underwater. According to Anadolu Agency, the tomb that was hidden underground for thousands years, was found after heavy rain triggered flooding and landslides. Bodrum Museum of Underwater Archeology staff went to the area after being informed about the discovery aiming to take it for further study and preservation. Rainfall that began early Thursday in Bodrum grew in intensity in mid-afternoon, turning streets into lakes and stranding drivers and pedestrians. Bodrum, one of the many resorts towns of Muğla province, is home to spectacular historical places, in where visitors can see the ruins of the once great Greek city at the Theater of Halicarnassus and the Mausoleum of Mausolus, which is listed as one of the Seven Ancient Wonders of the World. Bodrum also houses the Castle of St. Peter, a large Crusader castle that still remains intact. Halicarnassus which became today's Bodrum has been a home to various civilizations during the whole period of its history, including the Persians, Roman Empire, and Byzantines.